This is the sketch for the T-shirt project. 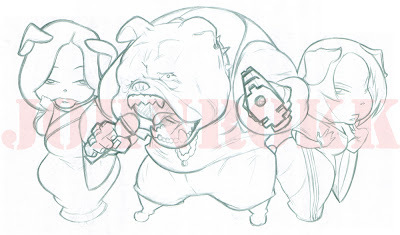 I went a bit more exaggerated with the bulldog to give it more attitude. The girls were supposed to look cute so I didn't draw them with any real bulldog features. If you like you can be on my friends link list.Just add me to your friends link list and open my blog http://makemoneyoninternet.blogspot.com/ and tell me to add your blog.